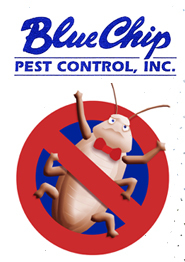 Blue Chip Pest Control, Inc. was founded in December 1985 and has provided quality termites and pest control services to thousands of homes, condominiums, apartments, churches, warehouses, restaurants and shopping centers in Orange County and Greater Los Angeles areas. Blue Chip Pest Control, Inc. has a full time entomologist on staff and a great team with a combined experience more than fifty years. We provide a high quality service and we take a great pride doing what we do best. Just take a look at our customer testimonial section and see what customers said about us.